Unlike umbrellas, this cover won't blow away! 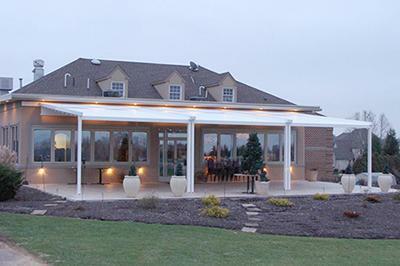 The Gennius is the newest innovation in European-style retractable patio covers. With an amazing ability to master inclement weather, the Gennius unfolds with the push of a button, guaranteeing use of your outdoor space. 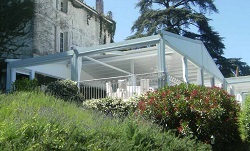 Most residential Gennius installations actually replace older lateral arm retractable awnings... 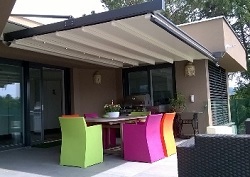 If you own an awning you're probably not surprised - as you already appreciate the many benefits of owning a high quality, custom shading solution; but have experienced the limitations of products designed mostly for shade. Once you have experienced outdoor living the way it's supposed to be, it's easy to understand the value of a better solution. 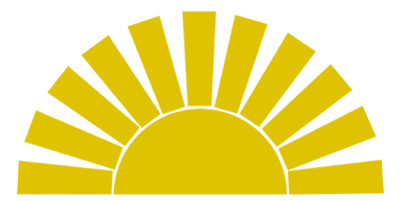 The Gennius is also an excellent value for businesses. 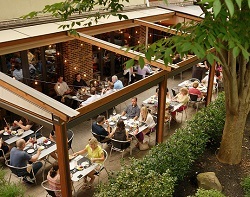 When it comes to expanding your outdoor dining - it perfectly fills the gap between the pros, cons and price points of stationary awnings and full-blown renovations. Own a restaurant, hotel, bar or cafe with outdoor seating? Imagine not having to shuffle patrons inside when the weather turns... Not booking interior space in the off chance of inclement weather for large bookings? Create that "closed in" feeling and protection without actually closing your patrons in! Described by Architects as "deceptively sleek", the Gennius is available with Flame-resistant materials. The A2c is capable of spanning an amazing 26' projection with no interior support posts - Perfect for maximizing a restaurant table arrangement. With its aluminum framework effortlessly and naturally integrating optional solar shades to enclose the perimeter, this is the most popular model in the Gennius family. While integrated rainwater management is standard on this model, lights and sound are optional. The L1S is a close second in popularity, for obvious reasons! The aluminum supporting framework is decoratively clad in Scandinavian Spruce, giving this retractable patio cover a softer, more natural look. Projecting up to about 20' from the wall, this model is the perfect option for people considering a pergola for their deck or patio. Gutters and rain management technology are also standard on this retractable enclosure. The A100 is the newest in the Gennius lineup. With its contemporary angles and maximum projection of 18', this model is perfect for smaller applications. 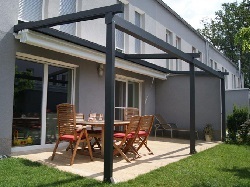 This freestanding retractable awning is designed for patios and decks where there is no wall or structure to install to. The fabric projects and retracts one way - on a shed-style, slope. With just one motor, the A2C Single can protect over 950 square feet of dining and entertaining space. 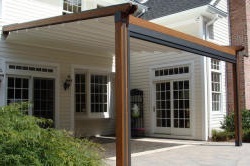 This freestanding retractable awning is designed for patios and decks where there is no wall or structure to install to. The fabric projects and retracts two ways - in an "a-frame" configuration. With just one motor, the A2C Single can protect almost 2,000 square feet of dining and entertaining space. The T1 is designed to install within or under an existing structure. Also capable of protecting against rain (when appropriately pitched) and the elements, this pergola shade is perfect for attaching to an existing pergola or trellis. Ravi Patel - Owner of Ravel Hotel and Penthouse 808 in Long Island City NY - "Don't let the rain eliminate your outdoor space. Invest in a Gennius and take control of your outdoor venue. You can rest at night knowing that you can take those reservations even if it rains." A triple Gennius covers the outdoor dining area of this golf course, which now books more functions. Solar shades were then installed to help block the west-setting sun and constant winds. Nomad Pizza in Princeton NJ expands its outdoor seating area. The awning creates an inviting shelter from the elements, drawing in patrons from a nearby shopping plaza. This rooftop restaurant and lounge offers award winning views of the NYC skyline. The flexibility and reliability of the Gennius allows this venue to guarantee dry weather for booked functions... without blocking the view! This homeowner in Wyckoff NJ wanted a pergola that also blocked the rain. The integrated front solar shade helps cool the home without blocking the view of the pool. A Gennius protects patrons and provides a break from the sun for patrons at the rooftop deck at Yankee Stadium. 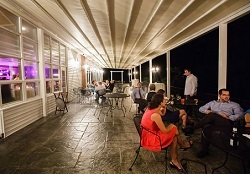 Delicious Heights Restaurant in Berkeley Heights NJ created a 4-season retractable enclosure with outdoor seating, complete with infrared heaters that warm patrons throughout the winter.